Santa Barbara, California, February 24, 2017 – Salty Girl Seafood, makers of sustainable, traceable, ready-to-cook seafood, are introducing their first item developed specifically with kids in mind – Salmon Bites for Kids – at Natural Products Expo West this March, Booth H933. Packed with omega 3’s and hidden veggies, these bite-sized finger foods are the first wild-caught salmon, breading-free product for kids of all ages. The product has been chosen as a finalist in two categories for a prestigious NEXTY Award, an internationally recognized award given to companies with the most innovative natural products. 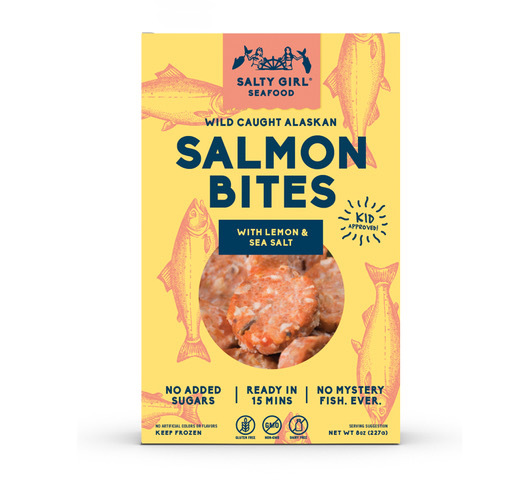 Made with wild-caught Alaskan salmon, broccoli, and sweet potato, Salty Girl Seafood’s Salmon Bites for Kids are naturally gluten and dairy free, non-GMO, with no added sugars, and no added artificial colors or flavors. They provide a healthy source of protein (12g per serving) and omega-3s. From more than 720 nominations, Salty Girl Seafood Salmon Bites for Kids, was chosen as one of the three finalists in the “Best New Natural Kids Product” category and one of four finalists in the “Best New Mission-Based Product” category for the NEXTY Awards. All finalist products will be showcased at Natural Products Expo West at the Anaheim Convention Center March 8-12, North America’s leading natural, organic and healthy products trade show. Salty Girl Seafood, Inc. is a sustainable seafood company founded in 2014 that develops sustainable, traceable, simple to prepare seafood products that incentivize sustainable fishing practices and promote stewardship of oceans. For more information on Salty Girl Seafood and where to find products in stores nationwide, please visit the Salty Girl Seafood website or join their community on Facebook and Instagram. Salty Girl Seafood co-founders Laura Johnson (left) and Norah Eddy (right). Photo by Lerina Winter (Winter Creative Co). Santa Barbara, CA, December 23, 2016 – Laura Johnson and Norah Eddy from Salty Girl Seafood have been honored for Vision by the Specialty Food Association’s 2017 Leadership Awards. The awards, which are given in three categories, Business Leadership, Citizenship, and Vision, recognize industry frontrunners who have gone above and beyond in advancing food standards in society—and society itself—by creating social, economic and environmental impact through innovation and vision. Nominations were made by members of the Specialty Food Association (SFA) and others in the specialty food industry. A panel of judges composed of industry experts and influencers selected the six winners from more than 50 nominees across the three categories. The awards will be presented during the Winter Fancy Food Show in San Francisco at a special ceremony on January 22, 2017. The keynote speaker will be Marcus Benedetti, chairman, president, and CEO of family owned and operated Clover Stornetta Farms. More about Specialty Food Association’s Leadership Awards can be found here.